1649 - William Tyng verbally granted James Everill and Joshua Scottow the right to install pipes and use water from a spring on his property to supply nearby buildings. This verbal agreement was formalized in a 1656 indenture (see 1656 reference). The area served by this system is known as the Blackstone block (see 1977 reference). 1652 - (BTR 2:108) 8 March 1651/2 It is Ordered that James Everill and the Neighbours which set up the Cunditt by the Dock shall have one of the Bells (which were given by Capt. Crumell) for a Clocke and to inioy it whiles they make that use of it There. 1652 - The "inhabitants of the Conduite Streete in Boston" including James Euerill, Joshua Scottow, William Hudson, Hannah Hanbury, Edmond Jackson, Willjam Awbrey, in behalfe of the yndertakers of the iron workes, possessing the right of Valentjne Hill and Joseph Wormell, Willjam Cotton, John Lowe, Leonard Buttles, Thomas Yeow, Richard Norton, and John Bateman petitioned the Massachusetts General Court, which on June 1, 1652, "duely weighing that the procuring of water into the sajd streete, not only to be a burden to heavy for any one to beare, but the priviledge to be to great for any one solely to enjoy, itt is therefore ordered aind enacted by this Courte and the authoritje thereof, that from henceforth the sajd inhabitants above mentioned shall be a corporation, and incorporated into one body or company." 1667 (BSR 7:38) 26 : 6 : 67 (August 6, 1667) Whereas there is great Annoyance by George Nowells stoppage of the watter course neere the Conduit, the Towne ordereth the sd Nowell to giue the said watter it[s] ancient passage, and free the street from such Annoyances within 15 dayes or otherwise to pay as a fine to the towne 20s a week for euery weekes defect, after the 15 dayes. 1668 (BSR 7:44) 26 : 8 : 68. (October 26, 1668) Vpon the Complaint of the neighbourhood and euidence that George Nowell hath stopt the water cource neere the Conduit, by buildinge his new house Hee is ordered to cleare the streete & passages of the water & to keepe them free from anoyance by the ouerfloweinge thereof within 15 dayes vpon the penaltie of 20s p. weeke. 1709 - (BSR 11:90) May 30, 1709 And that whereas the High way in Hanover Street at ye uper end thereof is now abl to be paved he is to give notice thereof to Coll Saml Checkly & the rest of the proprietors of ye conduit there, to take care to repair their pipes runing through ye Sd Street that So the Sd pavement be not damnified. 1711 - (BSR 11:143) August 27, 1711 Liberty is granted to Collo Samul Checkty to digg up ye H. way in Ann Street for the Repaireing the Conduit pipes there. 1712 - (BSR 11:161) At a meeting of ye Sel. men, Aprill 28th. Capt Habijah Savage & Compa hath liberty to digg in the Highwayes from yc Orange tree in Hanover Street to ye Condit in Ann Street for the repairing their Condit pipes provided they make good ye Sd Highway. 1712 - (BSR 11:175) At a meeting of ye Sel. m. Novr. the 10th Voted that in case the Proprietors of ye Condit in Ann Street do convey their wast water under ground into ye Dock ye Sel.m. will order forty Shill. to be pd. towards ye Charge therof. 1714 - (BSR 11:217) At a meeting of the Sel. men, Octobr ye 7th Liberty is granted to Mesurs Thoms Grose & William Tyler Wardens of the Conduit in Ann Street, to digg open the High way or wayes for the Repaireing the Conduit pipes wch are now Stoped. Provided that they do the Same wth Speed, and forth with repaire and make good the Sd H. way or wayes where the Shall So digg. 1715 (BSR 11:232) At a meeting of the Sel. men, the 9th of August. Liberty is granted to Mr Adina Bulfinch to digg open the Highway in Marsh Lane & in Marshells Lane for the repairing his Conduit pipes wch wr formerly Layd from the Conduit nigh the Mill Bridg to ye Sd Bulfinch dwelling House Provided that he forthwth repaire and make good Such part of the Sd High way where he Shal So digg. 1717 (BSR 13:24) Anno 1717. At a meeting of the Sel. men, ye 23th of July Liberty is granted to Habijah Savage Esqr . to digg open in ye H. wayes for the Repairing ye Conduit pipes, Provided that he forth with Repair and make good Such part of ye Sd H. wayes where he Shall So digg. 1718 (BSR 13:47) Decr . 6th. Liberty is granted by Mesurs Joseph Wadsworth, Wm Welsteed, John Charnock & John Baker Sel. men unto mr. John Pitts & mr John Pyn to digg open the H. way in Hanover street, Wings Lane & Anne Street for the clearing the conduit pipes in wch there is now a Stop, Provided they take effectuall care that the H. way where they So digg be forth with repaired & made good. 1719 (BSR 13:58) July 30th. Liberty is granted by Mesurs Isaiah Tay, Thoms Cushing, Oliver Noyes & William Clark Sel. men. unto Mesurs John Pitts and John Pym to digg open the H. way in Ann street for repairing the Conduit Pipes there Provided, that they forthwith Sufficiently repair & make good that part or parts of the Sd way where the Shall So digs. 1720 (BSR 13:74) Anno 1720. At a meeting of ye Sel. men, August 29th. Liberty is granted to Mrs Eliza Willard to digg open the High way in Anne Street for the repairing her Condit pipes there, provided She forthwith repair & make good that part of the Sd High way where She Shall So digg or cause to be dugg. Streets for Reparing the Pipes they making good the Said Street or Streets as sone as may be. 1733 (BSR 13:230-231) May 11th 1733 Liberty is Granted to Habijah Savage & Wm. Tyler Esqr . warden of the Condet to take up the Pauemeut & and Digg up the Ground to Clear the Pipes from the Orange tree to the Condet in Ann Street they forth with making good the Ground and Pauement to the Satisfaction of the Select men and from time to time keeping them in Repare. 1737 - (BSR 6:100) March 1, 1737 Whereas the Pipes Conveying Water from the Orange Tree to the Conduit in Ann Street Are Stopt and Application is made to the Select men for liberty to Open the Ground where it may be Necessary, in Order to remove the said Obstruction. Liberty is Accordingly Granted to Habijah Savage and William Tyler Esqr. to Dig up the Pavement, and to Open the Ground in Hanover Street, Wings Lane or Ann Street as Occasion shall require. Upon Condition that they Open the Ground for the length only of Two pipes at the same time, and that they then forthwith make good the Ground again, before they open in another place, that so the Inhabitants may not be incommoded thereby, And that they keep the same together with the Pavement in good repair from time to time to the Satisfaction of the Selectmen for the time being. 1815 - (BSR 38:148) Boston ss. At a Meeting of the Selectmen August 16. 1815. Present Mess. Bulfinch, Oliver, Hunnewell, Weld, Lovering, Austin & Williams. The proposals for digging a well having been renewed, & the subscribers having agreed to the terms proposed by the Board the following vote was ordered to be communicated to the Conduit Corporation. up the streets to repair them. N.B. The officers of the Conduit Corporation signified their consent to the above by their vote which is on file. 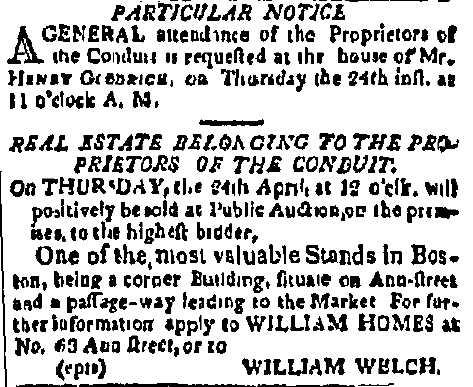 1817 - William Homes and others, "a Committee of the proprietors of the Conduit Corporation," petitioned the Massachusetts General Court that "he may be authorized and empowered to make sale of the real estate of said corporation." On June 16, 1817, a resolve was passed allowing the Conduit Corporation to sell its property and distribute the proceeds to the proprietors. 1656 - Robert Keaynes died in 1656 and bequeathed money for a Town Hall (built on the site of the Old State House) and a conduit to supply water to land south of the Town Hall. The conduit did not have a good water supply and was removed by his son-in-law Nicholas Paige in 1672. 1653 - Will of Robert Keaynes, August 1, 1653, from (Boston Miscellaneous Papers 10:1-54) Included a bequest of £300 for a Town Hall and conduit. 1659 - (BTR 2:158) 28: 11: 60 (February 11, 1659/60) Att a meeting of Hez. Usher, Jos. Scottow, Tho. Lake, Jno. Hull, Nat. Wilhams, and Wm. Davis. In reference to the accounts of Tho. Joy and partner for the building of the towne house, stayre cases and Conduit, and the compleating of the said worke, Itt is ordered that the Treasurer shall pay to the said Joy sixe hundred and eighty pounds (deducting what hath beene already paid) outt of the Treasury or next Towne rate ; whereby all contracts made with the said Joy are performed as per his owne hand to a writing of this date. 1671 -(BTR 7:66-67 ) 14:1: 1671-72. (March 14, 1671/72) At a meetinge of all ye Selectmen at Capt. Dauis house. Libertie is granted to Mr Nicholas Paige to take away the brickes belongeinge to the place intended for a conduit at ye end of the towne house before his dore, prouided he imediately fill the place euen wth the ground about it, for wch he brought a note from the Ouerseers of Capt Robert Keaynes Will, & a discharge for his guift expended thereabout, a Coppie where of followeth & ye Originall kept amonge the townes writings. To the Selectmen of Bostone. 1657 - The Boston Selectmen appointed a committee to ask permission of the Rev. Seaborn Cotton and his mother (widow of Rev. John Cotton) to secure a water supply for a proposed conduit. A second committee was formed to negotiate with workmen to construct the conduit. 1657 - (BTR 2:138) 28:5:57 (July 8, 1657) Att a meeting of Mr Wm. Brenton, Tho. Marshall, Sam. Cole, Wm. Paddy, Jno. Hull, and Wm. Davis. Deacon Marshall and Ensigne Hull are appointed to gaine liberty in writing of Mr Seaborne Cotton and his mother to bring water downe from their hill to the Conduitt intended to bee erected. Deacon Marshall, Ensigne Scotto and Wm. Davis, and any two of them are impowered to joyne with any one or two of the Committee to treate and agree with any workman for the erecting of and bringing water to the Conduitt intended to bee erected. 1685 - The Boston Selectmen authorized Capt. John Winge, Thomas Stanbury and others to construct a conduit to use overflowing water from a well recently dug at the late Thomas Brattle's house to the dock between the houses for the use by themselves and others who join with them. Nathan11 Williams, Thomas Stanberry, theire Company or Assotiates ; And for the benefit of the Towne in generall vpon any Extraordinary occasion as of fire breakinge out or the like ; They the sd Winge & Company obliginge them selues to make good the streetes and high wayes, at all times when they shall haue occasion to lay or mend sd pipes or Cisterne and to paue the streete & Docke head about the sd Cisterne, And whereas as the pipes are now layd & Cisterne made at theire charge. The Select men haue caused this motion to be recorded & granted the premises to them & such others as shall joyne with them in the charge for the vse aboue said, and to theire executrs and assignes soe long as they mainetaine the sd Cisterne with water sufficient for the ends proposed, and noe longer provided they doe not at any time (without leaue from the Towne) lay theire pipes any deeper into the sd well, nor build anythinge oner the sd Cisterne more then of necessitie to secure the water. Alsoe that the Towne shall not grant libertie to any pson or persons to lay other pipes from sd well, soe as to depriue sd Winge & Company of the benefit of the water before granted they the said Winge and Company, paying yearlie upon the 1st day of March 1s in mony beinge lawfully demanded by any of the selectmen or other pson by order of the towne. Alsoe if any damage come at any time to the sd Condict by reason of any publique vse, it shall be repaired at the charge of the publique, And it is further agreed that if the towne at their publique meetinge shall see cause to reimburse and repay to the said John Winge and Company the charge they have or shall be at in the transaction of the premises then the same shall returne and be for the use and benefit of the towne in generall. 1685 - (BTR 7:174) March 9, 1685/5 Voted that the Selectmens agreemt with John Winge and Company about the Condict and record thereabout is aproved of by the towne. 1702 - (BTR 8:26) January the 18th 1702 Voted that the Select men do cause a pump to be placed in the Condit by the Dock nigh Wings Lane, at the Town Charge and for Publick use in case of Fire. 1702 - Joseph Bridgman was granted permission to repair the cistern at the Governor's Spring on Spring Lane and convey the water through underground pipes to his nearby tannery. 1702 - (BSR 11:26) August 31, 1702 Liberty is granted unto Elder Joseph Bridgham to Newmake and repaire the Cestern at the Spring formerly Called the Governors Spring nigh unto the House in wch Mr Amos Richardson formerly dwelt, and to carry the waste water through the Street in pipes underground into his own Tan yard alwayes reserveing to the neighbourhood a Sufficiency of water for their use ; and to that end the Said pipes are be laid at least four foot above the bottom of the Said Cestern, Provided that ye Said Elder Bridgham, his heires & Successors for and in consideration of his and their enjoying Sd priviledge & benefit of the Sd waste water, Shall from time to time and at all times hereafter keep and maintaine the Said Cestern in good repaire, with a Sufficient pump for the use and benefit of the neighbourhood, with a conveniency to baile water out of the Said Cestern in Case of the breaking out of fire. Liberty is granted by the Select men unto Elder Joseph Bridgham to digg a pit or Cestern to retaine water for his use in the Towns Highway or Land Lieing before the House of Mr John Balston, on condition that he do Sufficiently Secure & cover and Keep the Same Covered to the Satisfaction of the Selectmen for ye time being. 1710 - Nathaniel Oliver was granted permission to water pipes in Water Street to serve his new brew house. 1710 - (Boston Miscellaneous Papers 29:198) June 29, 1710. To Capt. Nathaniel Oliver to Erect a Timber building or Shed of 50 foot Long, 22 wide & Six feet Stud, for the Setting of his Copper, on his Land adjoining to the North East side of his Brew house at the Lower End of Water Street in Boston, the sd building will Stand One hundred foot Distant, from any Dwelling house on that side. 1711 - Capt. John Ballentine owned a conduit running along Hanover Street near the Mill Bridge. 1711 - (BSR 11:143) September 3, 1711 Whereas the Mill Bridg is now abt to be made wider, and that So the Highway there may be more Comodius for ye Inhabitts. Ordered. That the Conduit at the Southly corner of ye Sd Bridg be made Levell wth ye Street. And that Capt. John Ballentine & others who claime Propriety in the Sd Conduit, be notified thereof. 1713 (BSR 11:197) December 28, 1713 Complaint being made. That the condit reputed to belong to Capt John Ballintine lying next the Highway nigh the Mill Bridg, doth lie open & dangerous to the Inhabitts that pass that way. Ordered, that notice be given to ye Sd Capt Ballintine that ye Sd Sel. men do require him forth with to cover and keep covered the Sd Conduit, or or otherwise to place Battlements round ye Same So as to prevent danger. 1722 (BSR 13:104) At A Meeting Octor the 12th. 1722. Liberty is Granted to Capt. John Ballantine to open the Ground in Hanover Street to Repare His Cundet pipes, He forthwith makeing good the Ground & pavement to the Satisfaction of the Select men & keeping them in Repair. A note about dates: The difference between the Julian calendar and the Gregorian is ten days between 1582 and 1700, and eleven days between 1700 and 1800. The two modes of reckoning are called "old style" and "new style." The Gregorian style was adopted by England and her colonies in 1752, when September third of that year was made September fourteenth. Before that time the year began on the twenty-fifth of March. Double dating is often used for dates before March 25th. Also when a month is indicated as a number it is from March as the first month. Boston Records Commissioners’ Reports (1674-1822) These include Boston Town Records (BTR) and Boston Selectmen Records (BSR) Cited above as (BTR Vol:Page) or (BSR Vol:Page) Note the page numbers are to the printed volumes. Suffolk Deeds, this 14 volume set records property transactions in Suffolk County (including Boston) from 1629 to 1697, and includes records of sales of shares in conduits. Cited above as (Suffolk Deeds Vol:Page) The date of sale and the date recorded are both noted. These can be found on Google books, archive.org, and Hathi Trust. Page 469: William Awbrey was a factor of the Saugus Iron Works of New England and was sent to Boston to hire a suitable warehouse. A note on this page indicates that Captain William Tyng was a partner in the iron works and died at Boston January 18, 1652/3. 1880 The Memorial History of Boston: Including Suffolk County, Massachusetts. 1630-1880. Volume 1, Edigted Justin Winsor. Includes several references to early conduits. 1891 "The Old Conduit" from A Topographical and Historical Description of Boston by Nathaniel Bradstreet Shurtleff. Much of the information in this account was later shown to be incorrect, see 1894 and 1907 references. 1899 "The Water Supply of the City of Boston" from Monthly Bulletin of the Books Added to Public Library of the City of Boston Volume 4, Issue 3, Pages 85-86 (March 1899) This List was compiled for use in connection with a lecture delivered by Professor William T. Sedgwick, on February 6, in the Central Course No. 2 of the Free Municipal Lectures held in the Old Public Library building. 1956 Water for the Cities: A History of the Urban Water Supply Problem in the United States, by Nelson Manfred Blake. Blake relied on Shurtleff's 1891 account (cited above), which later research showed was largely incorrect (see 1894 and 1907 references). Page 15: One of the earliest incorporations in the colonies was that of the Water-Works Company by the Massachusetts General Court in 1652. The proprietors of this Boston enterprise constructed the so called Conduit, a reservoir some twelve feet square into which water was conveyed through bored logs from nearby wells and springs. This supply served the convenience of neighboring families and was valuable in time of fire. But it never fulfilled the expectations of its promoters and eventually fell into disuse. Page 42: The English sent Scottish prisoners from the Battle of Dunbar to the colonies and many worked for the Saugus Ironworks, of which "seventeen worked for manager William Awbrey in the company's Boston warehouse."